the surface and leaving the leaves UPSIDE-DOWN on the water. Less than a wild guess, its a snapping turtle stomping in among your lily stems, chowing down on the stems. Big enough to drag around the foliage and tilt them upside down as it goes about grazing. You might notice 45° angle cuts, triangular notches when its turtles pecking. After heavy rains I get large turtles turning up to lay eggs, they then hop in the nearest lily pond to dine on fine cuisine. Resorted to turtle trap mk. V1 design, to stop them from banging holes in the pond liners and scoffing lily baskets at a time. A bait in a trap usually has the mischief maker in the trap the next day waiting for room service. A trip to a long lazy river besides a luxurious golf course. foliage and tilt them upside down as it goes about grazing. bites in the leaves. The leaves are perfect and upside-down. and scoffing lily baskets at a time. several koi and ate only parts of the body. We took it to a nearby lake. What kind of trap did you use? I like your lily pics. I did not realize you sold them on ebay as well. Yup I thin spares from over 100 varieties of waterlily now and then on ebay once in a while. Not much point sending classy named varieties to resellers who probably have ponds exposed to crown rot, I don't subscribe to the mantra 'the sooner they kill them the sooner they buy another'. I really don't want to be associated with blatant rackateering. 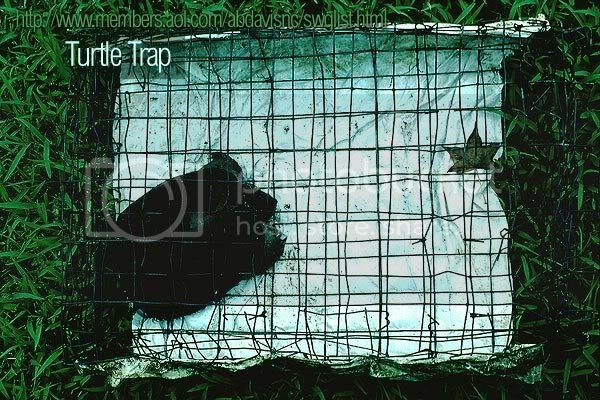 A photo of the traps, well, they are a cage, a simple bait, trap door mechanism... the turtle ambles in for the bait and conveniently closes the door behind it, then waits for room service to turn up. Usually has a turtle in the trap in less than an hour, set out just before twilight. Having seen ebay deteriorate from a user point of view, horrible messaging, ghastly dsr ratings, paypal ripping off accounts etc (paypalsucks.com) have been more impressed with other websites for listing stuff, better messaging, easier to customise listings, what websites do folk like to use to find stuff, besides, ebid, bonanza, webstore, aquabid?